CFI has created a new platform of custom-made business templates for financial analysts around the world. Check out CFI Marketplace and take your financial analysis to the next level! Download Accounting Templates that include popular resources relating to accounts payable, accounts receivable, depreciation, activity-based costing, cost of goods sold (COGS), revenues, expenses, and more. Get access to free and paid Finance Templates in CFI Marketplace. 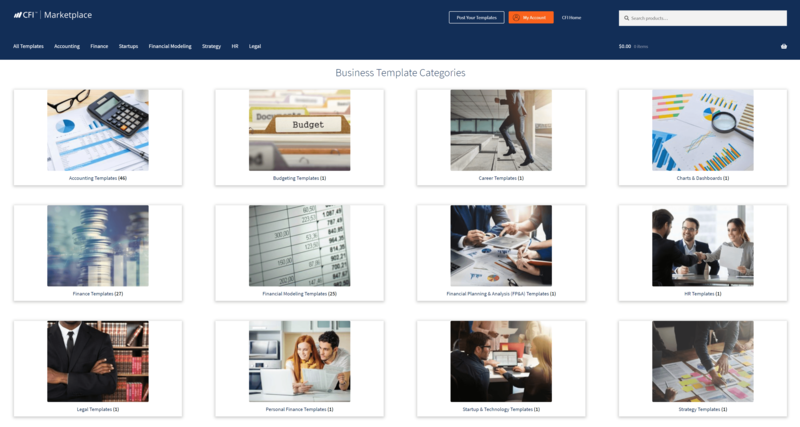 Frequently downloaded business templates include a capitalization table, cash flow reconciliation, cohort analysis, leverage ratios, and many others. Financial Modeling Templates may be one of the most exciting categories on CFI Marketplace. From basic to advanced templates you’ll find a three statement model, DCF model, LBO model, M&A model, sensitivity analysis, valuation models, and a wide range of others. To up your corporate or business strategy game, check out the CFI Strategy Templates. Examples of popular download are Porter’s 5 Forces, competitive analysis, industry analysis, SWOT, PEST, and other important strategic frameworks. Be sure to look at the Startup Templates if you want to accelerate the growth of your business. Frequently viewed items in this category include cap tables, option pricing models, budget templates, discounted cash flow analysis, pitch decks, and other important tools for founders. HR Templates are also popular and include things like resumes, cover letters, onboarding documents, performance reviews, and other human resources related items. Across all industries and stages of companies, it’s important to have good Legal Templates. Use CFI Marketplace as a starting point for documents like a Letter of Intent (LOI), Share Purchase Agreement (SPA), employment agreement, and other. Be sure to always get professional legal advice and never rely solely on a template. Share all your knowledge, tools, and templates with the world! With over 100,000 users you’ll have a huge impact with the financial analyst community on CFI Marketplace. Register as a Publisher and post your financial models. Register today and discover 100’s of high-quality and ready-to-use financial modeling templates for your project. Register as a UserMy account to download templates.